The hip is the joint in the hindlimb that is least commonly braced. are often managed with surgery and/or physiotherapy, as the hip is a difficult joint to brace, especially in large dogs. 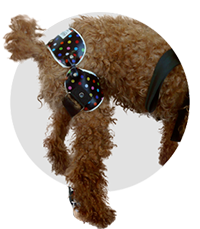 Hip orthoses can be used for smaller dogs that have instability in their hip joint on abduction of the hindlimb. The hip orthosis is used to control the range of motion at the hip so that flexion and extension are allowed, but maximal abduction is not possible.